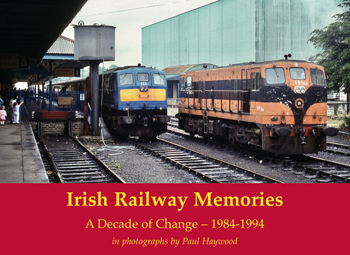 This is a collection of the author’s own full colour photographs as he went round Ireland photographing the railways with their colouful and attractive liveries, occasionally spoiled by being in need of a good scrub. The location featured include both Northern Ireland and the Republic. The captions are rich in railway information but are brought to life by the author’s undiminished enthusiasm and his reminiscences. Places shown include Waterford, Cork, Dublin Connolly, Thomastown, Ballybrophy, Clonmel, Killarney, Kilkenny, Belfast Central, Lisburn, Bangor and more.